Jenn, Veege & Rachelle thanks for taking the time to do an interview with us today. 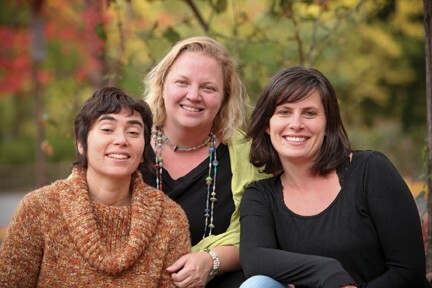 Can you please start by giving us a little background behind the Oak Grove Midwifery practice? Jenn: The three of us knew each other peripherally for a while, and when we got to know each other better, it just made sense to work together. We each have families with younger children and want to be able to be mothers and midwives! Midwifery is an all-encompassing occupation, so I aways knew I wanted to work with a partner to help share the responsibilities and to have a second set of eyes or brain to bounce something off of. It just so happens, I got 2! We created a model of midwifery care that is both sustainable for us as mothers and midwives, but is also beneficial for our clients. We love and respect each other, just like we do with our clients. I couldn’t ask for more! Straight to the point, why is home birth an important birthright for women of the 21st century? Veege: On the one hand, we need to remember that modern women are human women. What I mean by that is that throughout human history, the female body has evolved to give birth successfully. Birth physiology is optimized when least disturbed. Fear, strangers, bright lights, overstimulation of the cerebral mind- these things can cause subtle, or not so subtle, disruptions in the woman’s flow of hormones and endorphins released during a natural birth. Midwives, and I believe home birth in particular, protect the natural process as much as possible. On the other hand, modern woman have a reasonable and valid expectation of safety. Being attended in birth by trained professionals who know when to intervene can and does improve outcomes. Home Birth with midwives holds the two hands together; our training teaches us to recognize and protect normal birth physiology, and to respond to complications of labor and birth as quickly as possible. But perhaps the most pressing reason that home birth is a birthright in these times, is in reaction to the over-medicalization of childbirth. Western medicine took a wrong turn when it comes to normal pregnancy and childbirth. Interventions such as inductions and epidurals are increasingly routine, the Cesarean section rate is too high, and the definition of a normal natural labor is too narrow. Of course, obstetric interventions can be life-saving and completely appropriate for high-risk pregnancies. But for women with normal pregnancies who choose natural birth, home birth should be an option. There is a strong history of home birth in the Rogue Valley. How does it feel to continue the tradition? Rachelle: It is such a pleasure to continue to support women in the Rogue Valley in their choice to have home births! It is great to see it continue to grow as a valid choice for healthy, low-risk pregnancies. Jenn: I feel by continuing the honored home birth tradition of in the Valley, we are continuing to normalize birth in an ever-increasing medicalized system. I love it! Expecting mothers and fathers have literally hundreds of choices available to them when they are choosing a birth plan and birth team. What advice can you give to anyone who is in this process now? Jenn, what is your top priority when working with your clients? Jenn: My top priority when working with a client is to make sure she is safe, respected, nurtured and empowered as an individual. No two women, pregnancies, or births are the same, and each woman deserves tailor made care just for her. Rachelle, how does your team create women centered care? Rachelle: Our midwifery group values every woman and recognizes that she carries within her her own innate wisdom and knowing when it comes to her body, baby, and family. We provide education, support, and encouragement as she faces the many choices available in pregnancy and labor. Care optimally begins in early pregnancy, or even pre-conception, and is individualized care that focuses on each woman’s specific set of circumstances. Our visits average an hour at a time, which allows us to work closely with each client. Veege, what would you say to someone interested in exploring home birth but doesn’t know where to start? Veege: Come in and meet us for an interview. Talk to parents in the community who have had home births. Explore authors such as Ina May Gaskin, Penny Simkin, Elizabeth Davis. Watch documentaries like The Business of Being Born or Orgasmic Birth. Ladies, what is the core benefit of working together as a team of three primary midwives? Veege: We share the on-call responsibilities and approach our client care responsibilities as a team. This benefits us by preventing burn out and helping us balance the demands of a midwifery career with raising our own families. Clients get to feel held by more than one practitioner, and get to work with different personalities and opinions. Because we have a team, if we have more than one birth at a time, our clients will still get at least one of us at their birth. We design our appointment schedule so that our clients have the chance to get to know all of us well. We have fun together. I’ve run across stats that show that in countries like Brazil high percentages of expecting mothers were electing to have pre-planned cesarean surgery. In other words they are not having natural child birth. What happens when women give up their birth right to natural birth? Rachelle: There is so much lost in a culture when we wander far from our reliance on ourselves and our bodies!! Women have been birthing naturally for so long, yet with medical technology as come a pressure to place more trust in it than ourselves. This does not mean that there is not a need for medical intervention sometimes. There absolutely is, and we are fortunate to live in a place where we have access to those when they are necessary. However, most women can have babies safely and beautifully with little to no intervention. To lose our knowledge as women who trust their bodies is a tragedy of modern medicine. Women are strong, powerful, intuitive beings and it is so important that we claim our right to our bodies, our babies, and our choices. Collectively all three of you are mothers and all three of you have daughters. How has having your own birth experience and now having daughters changed or supported your own views of midwifery? Veege: My two home births were each a rite-of-passage for me. I felt both extremely vulnerable and extremely powerful all at the same moment and that duality was an essential part of my experience. I wanted natural births because I believed that it would be healthier for my babies, would pave the way for our bonding and breastfeeding, and would be the most satisfying experience for me. I wanted to avoid the cascade of intervention that can happen when one intervention leads to another which necessitates another, and pretty soon, what could have been a normal birth is now an emergency. I knew my best chance at having natural births was to be at home with a midwife, and that worked out well for me. Now I get to bring that trust I have for women’s bodies to other women, and carry the tradition of midwifery into the future so it can be available to my daughters’ generation. Jenn: I have a diverse history of birth in my family. My great grandmother birthed 21 children at home, my grandmother was a rural midwife in Kentucky, and my mother had two cesarean births. I have three daughters, and the two older ones have already said they want to have me as their midwife when they have their babies at home. What a wonderful honor it would be to be a part of the births of my grandchildren. I was born by cesarean section and was not breastfed. My own birth experience informed my expectations for the births of my children. My mother did the best she could with the information and support she had. With my first daughter, I was young and not exposed to natural birth in any way. When the day came for me to give birth, I walked into the hospital and asked for a glass of water, but the nurse told me that my doctor expected me to go to surgery, so I couldn’t have anything. I, however, did not end up with surgery and it forever changed my views on who I am, and what birth could be. Each birth taught me more and more about myself as a woman and a mother. With my youngest daughter, I chose midwifery care, and to have a doula. I was heard, supported and loved through my entire pregnancy and birth. I spent an hour each prenatal with my midwives. I cried, laughed and planned with them. Pregnancy and birth with a midwife was a life changing journey for me. My mother was originally hesitant when I began my journey to have a home birth and on becoming a home birth midwife. She is now the biggest advocate for home births and will be excited when her granddaughters birth at home! I love that we have come full circle in my family. One thing I’m not sure people who are un familiar with home birth might not be aware of, is to what extent midwives go to care for their clients. It’s not like at a hospital or birth center situation in which your doctor might go on vacation or have taken the day off when you happened to go into labor. Veege: At least two of us from the practice will always attend the birth. During the prenatal and postpartum visits, one or two of us will be there for the appointment. Rachelle: We are available 24/7 for our clients. Whenever a woman or her family needs support, they will be able to reach one of us. Pregnancy/birth is an incredibly important and powerful time in a woman’s life, and we honor that. We value building trusting and close relationships with each client and the whole family! Jenn: We make home visits when mama’s are in need at any point in their pregnancy. We excuse ourselves from dinners, movies or other occasions so that we can meet the needs of our clients. We are present for our clients and their whole family. By the end of our journey together, our clients are like members of our family. What if the woman wants a home birth experience but her husband or partner is not comfortable with that idea? What do you suggest to men and expecting fathers when looking to support their wives and daughters with the choice of home birth? Jenn: I think that it is totally normal for fathers, brothers, and men to be concerned about his growing family and the care they choose. A woman will birth best in an environment that she feels most comfortable in, and for many, that is at home. So many men in our community have supported the special women in their lives to birth safely at home. I am sure there are plenty of home birthing fathers and family members that would be willing to step forward and speak to it. We can always arrange for perspective clients to hear from past clients. Veege: Safety is essential. In fact, if a mother doesn’t feel safe it violates the natural physiology of labor that I have made so many references to. Some women feel safer in a hospital. Some women feel safer at home. That feeling of safety is a very important piece and can contribute to good outcomes and satisfying experiences. Then, of course, there is the other aspect of safety, which is about risk. Through holistic prenatal care, midwives use tools such as complimentary therapies (acupuncture, herbalism, etc), nutrition, and education to reduce risks. Our practice has protocols for transferring care to a physician during pregnancy or birth if medical complications arise. Some risk is inherent to childbirth; emergencies, though rare, do happen. We are trained to manage emergencies at home and do not hesitate to transport quickly to a hospital if needed. Our clients are informed and educated about our skill level and the risks involved, and still choose home birth because of the many benefits for moms and babies. No environment, no care provider can remove all risk from the childbirth process. However, planned home birth has been shown in scientific studies to be equally as safe as hospital birth, with fewer complications related to intervention. What does an empowering & joyful home birth look like? Veege: It looks thousands of different ways. Each birth is so unique. I think it’s important to treat mothers and babies like a unit- their needs are so entwined, not polarized. Every mother wants a safe birth and a healthy baby- that’s a given. And, her experience matters. I think an empowering birth is one in which the mother meets the challenge. Her challenge might be pain or discomfort. It might be that the birth is very long or very fast. The challenge might be giving up her dream of a home birth and transferring to a hospital because of safety. When she learns something about her stamina or ability, when she deepens her trust in her body- those are empowering things! I certainly see laughter and loving moments between couples or other family members at births often. Obviously there is the look of joy and amazement on the family’s faces when the baby is born! Joy can also come from the feeling of being centrally involved in her care. Is she offered real choices? Is she well supported physically and emotionally? Was there a good outcome? These things bring joy. One of your most recent and favorite birth stories or testimonials? Veege: I love attending births and don’t have a particular favorite, though there have been some moments that stand out as especially moving or amazing. A mother’s birth story is her own. We don’t share those birth stories publicly without permission, as we protect the privacy of our clients. We will be putting some testimonials up on our website in the near future. I understand you will be having an open house in which you will be inviting expecting parents to learn more about your service. Jenn: We are very excited about our Open House! We will be having it in the parking lot of Jade Mountain Medicine at the corner of B and Oak across from the Armory on the First Friday of October. October 5th. We are hoping to have an outdoor movie, live music, and an art exhibit featuring pregnancy and motherhood! We invite anyone who is considering home birth, would like to meet us or just interested in seeing some cool art or videos to come on down. There will be a comfortable place to nurse, rest or get a glass of water.